The Tamarack Solar 10TP-MID/6072 Top of Pole Mount is an extremely sturdy, universal pole mounting solution for small area solar photovoltaic needs. With its user adjustable angle settings (0° to 50° in 10° increments), the Top of Pole Mount can support installations in a wide range of locations. With the multi-pole option you can start by mounting (10) 60 and 72-Cell modules, with dimensions less than 79.5" x 39.5", over two 6" SCH 40 steel pipes (not included) and quickly add 6 more modules with an additional 6" pipe and the 6TP-ADD/6072 (sold separately). You can expand the system as long as space allows to have a seamless plane that remains seasonally adjustable. 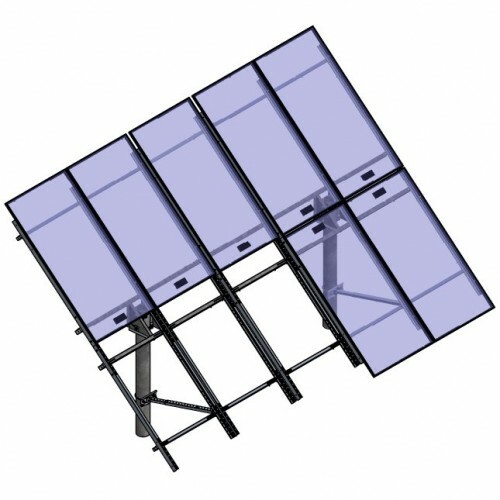 All mounts are manufactured using pre-galvanized steel and heavy-duty corrosion resistance 5000 series aluminum. The 10TP-MID/6072 Top of Pole Mount is designed for mounting (10) 60 or 72-Cell module in a portrait orientation. If you need to mount 1, 2, 3, 4 or 6 modules, you should consider the STP and LTP mounts. Heavy duty pole mount system, utilizes two 6" Schedule 40 steel pipes (not included) for a 10 module configuration (expandable to 6 more modules with an additional 6" pipe and 6TP-ADD/6072 (sold separately)). Designed for 100+ mph winds with their included VEE BRACE Kit.